For this week’s Roundtable, we’re taking a break from our usual movie list discussions. We’re going to shift gears a little bit and talk about something more personal. Most home theater owners like to decorate their HT rooms with posters, memorabilia, knickknacks, and other interesting odds and ends to celebrate their favorite movies, TV shows, and pop culture happenings. Let’s take a look at some of our personal favorites. We also have a special guest blogger this week. Adam Tyner from our sister site DVDTalk will be joining us to weigh in. I’ve got to say that I’m pretty impressed with my own collection of movie-related junk. I’ve got posters from around the world, including an Italian ‘Psycho’ one-sheet, Belgian ‘Taxi Driver’ and ‘Written on the Wind’ minis, and some ‘Christine’ lobby cards from the good ole U.S. of A. that I’ve handily framed in chrome silver. I have a soundtrack album from Brian De Palma’s masterpiece ‘Phantom of the Paradise’ that I framed. I even have some props from ‘The Curse of the Jade Scorpion’ and ‘Men in Black II.’ (Where those came from is another story altogether). But the one item that I would probably grab first if my house was on fire and I only had a few choice seconds to decide the fate of my precious valuables is my Teddy bear from Steven Spielberg’s ‘A.I.‘ The toy manufacturers probably thought the movie was going to be a big commercial hit. (It’s a Steven Spielberg movie about robots, after all.) But word probably reached them swiftly that this was a relentlessly bleak sci-fi epic, not a cuddly kids’ movie. Still, some Teddy bears did reach the market. I’m not sure how many got out there, but I have a feeling that the collectible will one day have an air of that “Boba Fett that fires real missiles” mystique. (A quick eBay search pulled up one going for $200.) However, it’s not the rarity or the coolness of the toy that would make me save it first. It’s because, when you squeeze its tummy, it mutters things in that gruff, chain-smoky voice. And, really, while a lot of my art and collectibles are nifty, Teddy is the only one that’s really cute. I don’t collect things, as a rule. I have a modest selection of Blu-ray discs, a decent stock of videogames and a bit of game art on my wall, but I’m not the guy who holds onto all his old stuff just for the sake of holding onto it. I keep it while I’m using it and unload it when I’m not. But there are a few exceptions, even for me. Mad Magazine #233 from September 23, 1982 is probably the coolest of them. It’s not in great condition. In actuality, it’s only a framed cover. 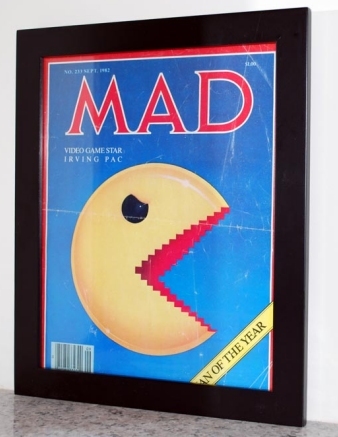 It’s a pretty cool cover featuring Pacman (named Irving Pac by Mad), and appropriate for the time, but that’s not what makes it so worthy of hanging on to. I was born in July of 1982. This cover has been with me since September of the same year. I was raised on a steady diet of videogames, starting with the Atari 400 (none of that 2600 junk for me, thanks) and moving to the Atari 130XE, NES, SNES and the rest. ‘Pacman’ was the beginning of all that. It was the first game I played, and a favorite of mine for a long tim. I don’t play ‘Pacman’ all that often these days, aside for the occasional game of ‘Pacman Championship Edition.’ That same magazine cover is still there, though. It’s important to remember your roots. 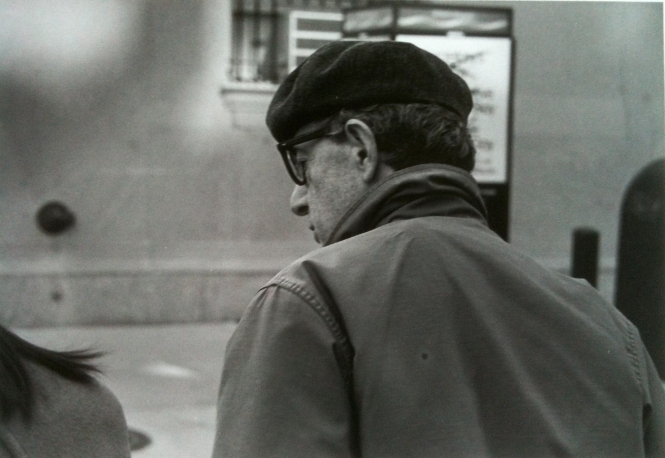 I’m a Woody Allen fan. I’ve loved his movies since I was a kid growing up in New Mexico and happened to catch ‘Sleeper’ on TV. I mention New Mexico, because I doubt too many of my classmates grew up enjoying movies about a neurotic New Yorker. (I don’t think anyone else in town did either. I could always find previously-viewed VHS tapes of his movies in mint condition.) Of course, since my mother is a neurotic New Yorker, it all sort of made sense. Simply put, I grew up thinking the guy was a genius. I still do! And since I’m not from New York (a place where folks throw around the G-word with abandon), I don’t use that word lightly. He’s the only director I know whose films all demand a second look. So that’s what I did. Click. I snapped a photo as they continued on, then I headed on my way. It’s not straight-on, but the figure in the photo is totally recognizable, and in some ways I think it’s better than a regular snapshot would ever have been. Either way, that’s the story behind the most prized item in my home theater. My most legendarily geeky stuff isn’t in my home theater room, so I can’t ramble on about, say, my endlessly sprawling ‘Scott Pilgrim vs. the World’ shrine or my ‘Killer Tomatoes’ archive. Pretty much every square inch of my living room is covered with posters, DVDs, and Blu-ray discs. You can tell with a quick glance just how spastic my taste in movies is. I have a heavily autographed one-sheet from ‘The Princess and the Frog‘ right to the slimy space-slugs from ‘Slither‘. A poster for ‘Josie and the Pussycats’ is saddled up next to the coffin-shaped boxed set for Amando de Ossorio’s ‘Blind Dead’ tetralogy. My stack of autographed posters and DVDs in there span everything from the stars of ‘Mystery Science Theater 3000’ to Weird Al to comic artist Bryan Hitch. I have a definite soft spot for my ‘Venture Bros.’ DVD set autographed by artist Bill Sienkiewicz and the ridiculously random UK import of ‘Make It Happen’ on Blu-ray that I asked Mary Elizabeth Winstead to sign a couple of weeks ago. 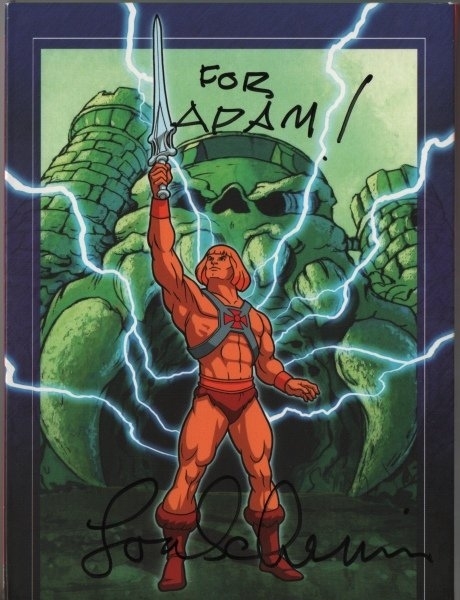 If I had to pick just one highlight, though, it’d be a ‘Masters of the Universe’ DVD set autographed by Lou Scheimer, Paul Dini, Jay Scheimer, Tom Sito, Erika Scheimer, Bruce Timm, and Tom Tataranowicz. Nothing defined my childhood quite like He-Man, and nothing’s defined my adult life quite like my home theater. So it’s kind of great to be able to point to one thing that manages to encompass both. Even though I came up with this week’s crazy topic, I must confess that I’m cheating a little with my answer. The item I’ve picked isn’t currently on display in my home theater, but I honest-to-god plan to put it on display eventually. I own it, it’s in my collection, but I just haven’t found the time to frame it or found the right place for it yet. Don’t get me wrong, I have plenty of movie and TV junk littering my HT room. A host of action figures proudly stand atop my DVD/Blu-ray shelves. One on side of the room, two of the giant mech robots from ‘Neon Genesis Evangelion‘ aim their enormous weapons down at my seating position. On the other side, I have a mini diorama with Mulder and Scully from ‘The X-Files‘ conversing with Dr. Evil from the ‘Austin Powers‘ movies while a warrior bug from ‘Starship Troopers‘ sneaks up from behind. 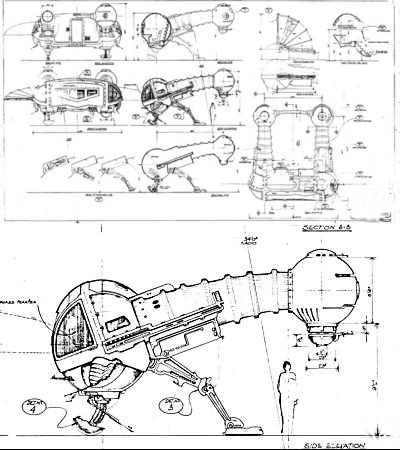 I’ve mentioned once or twice before in this blog that my favorite movie is ‘Dune‘ and that I own a huge collection of memorabilia from that film. Sadly, most of those items are currently boxed up, out of sight. If we ever move to a larger house, I’m going to need a lot of space to build a proper ‘Dune’ shrine. In the meantime, I have a framed poster on my wall, but that hardly seems like anything too special. Now it’s your turn. Tell us what items you’re proudest to display in your home theater. There are two things that are on display in my home theater that i just can’t imagine being without. First, is a full size 7′ vinyl “Fellowship of the Ring” teaser banner (the one with the two giant statues on the river) in Portuguese that I picked up in a hole in the wall video shop in Brazil for around $2. The other is a display piece for my Star Wars DVDs that my dad and I built together. It has Darth Vader and Obi-Wan action figures standing on pedestals next to steps that lead up to bookends with the Rebel and Imperial symbols modeled after the buildings on Coruscant. It was a great bonding experience to build it with Dad, and it’s wicked cool to boot. The Complete Calvin & Hobbes. The epic hardbound, thirty pound, three volume masterpiece. It sits on a bookcase, towering above all other collected entertainment. It’s the essense of my childhood. In my entertainment room I dont have much as its our normal living room, but overall I would say my entire collection of things I enjoy, I have just about every Full Moon Pictures box set, plus a ton of others of course, 400+ DVDs and 200 or so Bluray/HDDVDs, My favorite is the numbered copy of Army of Darkness (only 30,000 made), I also have signed copies of Re-Animator (Jeffrey Combs), Hellraiser (Doug Bradley and Ashley Laurence) Jeepers Creepers 2 (The Creeper himself :)) and Day of the Dead (Tom Savini) and I also have the imports of the Hellraiser box set from the UK and the Phantasm Ball box set also from the UK which I’m going to get signed in about 3 weeks by Don Coscarelli, Reggie Bannister and Angus Scrimm, plus I hope to get my Hellraiser box signed again by Doug Bradley, Ashley Laurence and this time Clive Barker as well….ooh I cant wait! I think I misread the original question – I thought it said the one thing that you display proudly in your home theater. With me, its my laserdisc player. That gets more talk than anything else (although, about 3 years ago, the talk was about my PS3, my Wii and my Xbox 360, but everyone has those now). Yes, the laserdisc player is commonly mistaken as a 5 disc CD changer by most. That is when I go and pull laserdiscs off the shelf, and see jaws hit the floor. Very few people seem to know what it is. That being the case, one thing I am proud of is my Laserdisc Collector’s edition of Fantasia. Yeah, I picked it up for like $20 off of eBay two years ago, but I have been wanting this thing since I was ten when it came out. I practically begged my parents for it, even though I had no clue what a laserdisc was. It was just SO cool! Nowdays, the things on display are the things I wish I had someplace else to put them. I got the boxed “trunk” set of Harry Potter Blu-Rays, and the big box of Gone With The Wind (I am okay with that one, it just looks SO pretty, with its red velvet box and cardboard blue trimming sitting there on top of my shelf). The posters are actually a funny story. In the living room, I have a movie poster for the first Narnia movie, two from Return of the Sith, a Names of God poster (I am a Christian, and there are a few crosses and poems on my walls), and a book poster for Harry Potter 7. That’s not the funny thing. I still have, in an oversized mailer box, a movie poster of Dreamer. Had it for about 5 years now. I loved the movie, loved the poster artwork, and was so mad that I could not find a poster of it. I found one on eBay, and paid like $20 for it, and its still in the box. Why? Because its a movie THEATER poster of the movie. This thing is huge! As much as I love Dakota Fanning, it just seems weird hanging a poster in the living room where her head appears three times larger than life. That doesn’t mean I don’t have anything with Dakota Fanning on my wall. In fact, I got a wall with a small, but growing, autographed photo area. I only have three framed at the moment – Rick Moranis, Dakota Fanning, and Elle Fanning, but I do have more in the bedroom – the entire 1996 US Women’s Gymnastic Olympics Team and a good deal of the 2008 Olympics team. Nor are they the only things autographed hanging. I got pictures of family and friends, but a couple of years back, my goddaughter wanted to get into modeling or acting. I took tons of pictures of her for a portfolio, and had a few printed. For fun, I had her autograph them. Lastly, in the bedroom, on top of my movie case in there (all VHS, DVDs and Laserdiscs are stored in the bedroom – only keep Blu-Ray and HD-DVD in the living room, although the laserdisc player and VCR are in the living room – its a storage / looks thing), I have a boxed set of the original Star Trek cast. I don’t think its the original figures, as the box set is numbered. In the bedroom, I also have additional movie posters – the first two Harry Potter movies, Bill & Ted’s Excellent Adventures, and Karate Kid. My next thing to add? Well, getting that autographed photo from Elle Fanning (just got a few weeks ago) really made me think about adding some more, so I have been researching some of my favorite stars and see about writing their fan mail addresses and see if I can get anything. I think I waited too long on Mel Gibson though, I heard his agent dropped him. 🙁 Still, want to try with Kirk Cameron, Scott Bakula, the entire ST:TNG and TOS crew (those who are still alive), Nicole Kidman, Abigail Breslin, Bailey Madison and Anna Sophia Robb. Don’t have room for them all, but I am willing to bet I won’t hear back from half of them anyways. My movie collection, by far. Several hundred each of blu-ray discs, hd dvds, and dvds. I’m only 25 and have amassed a several thousand disc collection. People come in and see this giant wall of movies, and they’re like BAM that’s amazing. Maybe it’s sad? I dunno. I own my house and am doing well for myself, so I feel pretty good about it. Well, I guess i would have to say my blu-ray collection as other above have, but I don’t really think this counts. I interpreted the subject to be more about memorabilia. – A full-scale (and wearable) replica of Hellboy’s right-hand of doom. – A massive, framed teaser poster for Terminator 2 (just the iconic image of Arnie on the bike, with “SCHWARZENEGGER” written at the top). – A massive teaser poster for Spiderman, the one that got recalled because the reflection in his eye featured the twin towers. – A framed poster of the Rocketeer in the art-deco style. I have two pieced of memorabilia in my room (where I watch my movies) that I treasure, but only one is on display (on my desk). The undisplayed item is a call sheet from The Departed that I bought on eBay while the film was still shooting, which I then got autographed by Martin Scorsese when he shot some scenes of the film in my neighborhood. The call sheet is for a shooting day in Boston, but at least it is for the same film that I met him working on. The item I have on my desk is a 8×10 color photograph of my late uncle enjoying holding court in his social club as he always did with some friends and Jack Nicholson (the always did part does not apply to Jack). Jack hung around my neighborhood and specifically in my uncle’s social club to prepare for his role in Prizzi’s Honor. The best thing about the picture is that it doesn’t look like a bunch of guys taking a picture with Jack. Jack is far right, my uncle is in the middle, and four other guys (my uncle’s friends) are to the left…basically it looks like a bunch of guys and Jack wanted to take a picture with my uncle. Easily, my favorite item displayed in my room.